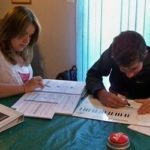 Summer Theory Lessons - What do you need? The goal of the Summer Theory Drop-In Club is simply for students to complete a lot of theory in a little amount of time. Oh, and have fun! 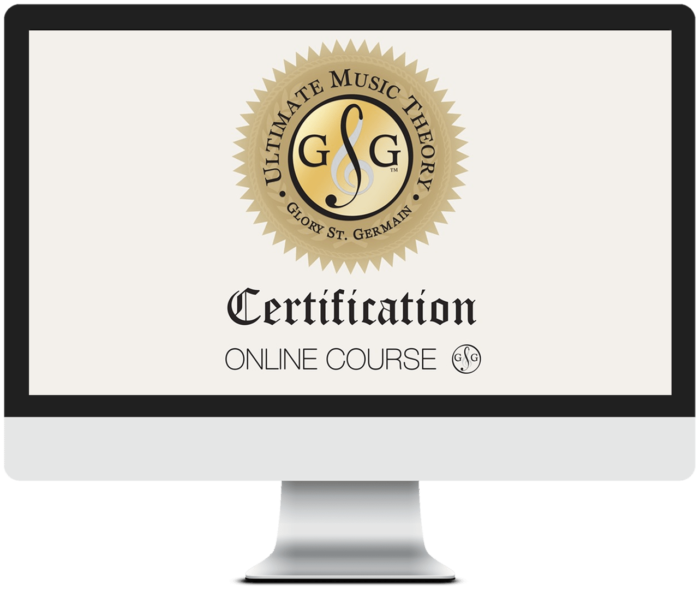 For my UMT Summer Theory Drop-In Clubs, any student who is at ANY point in any level in the Ultimate Music Theory Series can attend. At any Drop-In, I might have students representing each of the 4 theory levels (Preparatory, Basic, Intermediate and Advanced). The best Summer Drop-In Lessons have students of all levels. The joy of this is that when I take a moment to explain a new concept or review a tricky concept, all the other students hear the explanation. Therefore, they either get the review or they get motivated about something new and exciting that is coming up. My Summer Theory Drop-Ins are 2 hours in length. Yes, 2 hours of theory fun and activities...and believe me, I've had kids BEG to not leave at the end of the 2 hours. I run my Summer Theory Drop-In Lessons the same way. First one to arrive is the first to have any "bonus pages" (pages completed at home) marked. After all bonus pages are marked (and each child's clipped page corners are put in THEIR "trash can"), I just start marking pages as they are completed. For one hour, I sit there and every time the student hits the "Easy" button (when they complete the writing work on one page), they pass me their book to mark their page! Snack Time! After one hour, we have our (Optional) "commercial break" - we have our snack and watch a music/theory related YouTube Video. Watch the Ultimate Music Theory Lesson with Granny D - Bass Clef! Watch the Ultimate Music Theory Lesson with Granny D - Tied Notes! Then, back to Work until the parents come and drag the kids away from the table! It is a Drop-In, so students can sign up to participate in 1 group or all the groups. 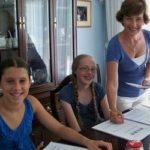 Ultimate Music Theory Summer Theory Drop-In Lessons are NOW AVAILABLE! Space is Limited to the first 5 Students for each Drop-In Lesson, so sign up early! Cost: Here you can choose to use whatever payment plan works best for you. Option#1: Take your 2 hour lesson fee and charge 1/2 of that rate per student per Drop-In Lesson. The student gets 2 hours for the price of 1, and you can have a financially successful Theory Drop-In with only 2 students. Option #2: Take your 2 hour lesson fee and charge 1/3 of that rate. Again, you "break even financially" with 3 students. Any more is "bonus". Cancellation Policy: If you must cancel your child's participation, 48 hours notice is required. If less than 48 hours notice is given, or if no notice is given, you will be charged the remaining balance of the Drop-In Lesson Fee. Lessons cancelled with more than 48 hours notice will not be charged the remaining balance. Please note - the Registration Fee of $15 per Drop-In Lesson is non-refundable. 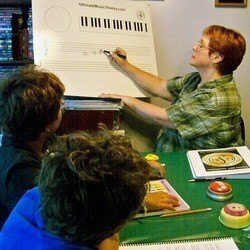 Ultimate Music Theory Drop-In Lesson Dates: Then list the dates. My Summer Theory Drop-In Calendar will look like this, so they simply check the dates they will attend. OPTION: For Student who want to attend both drop-ins, you can offer a "lunch service"! Summer Theory Lessons ROCK with UMT! 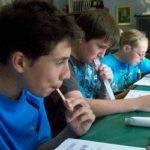 You can offer Summer Theory Drop-In Lessons as often or as little as you want. But it is a super fun way to keep students working on theory (and make some money during the summer). From my experience, it takes a bit of "coaxing" to get kids hooked on the idea of having fun with Theory - but now I have students who plan their holidays around when I am having Summer Theory Drop-In Lessons! There are no lesson plans to make (except selecting your "commercial break" of the day, and that's optional!) and if it is nice weather, you can even do theory outside! Bonus! I LOVE THIS! And I especially love your accent Glory, and your presentation! You are so captivating – and inspiring to me also. Thanks Charlene, Shelagh and I had a lot of fun doing the videos!